Thanks to Robert Drumm for writing this guest post. Robert is currently an attorney at Van Osdol and has a long history of completing private company transactions. We’re grateful he was willing to share his expertise here. We need to finalize your CIM, because we have a client under an NDA to send it to, and if we can get to an LOI, they’ll go right to a PSA and close in 60 days! CIM? NDA? LOI? PSA? 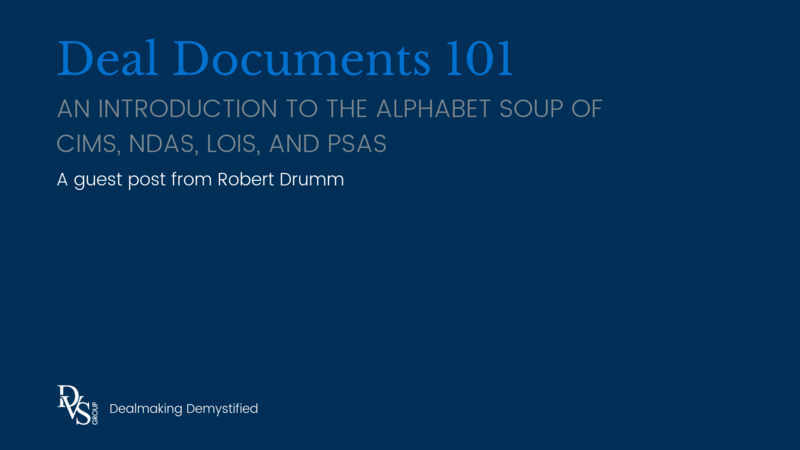 Most of the time, we use this lingo for our own convenience—and not (just) to sound like we’re smart or have some “secret sauce.” But we shouldn’t be using it with our clients without any explanation, and so with apologies for all those times we forgot, we are going to run through these documents that we know by their acronyms. The “CIM” is the Confidential Information Memorandum. It is the most common name for the basic—sometimes lengthy—disclosure document that Sellers and their advisors prepare when they take a company to market to sell. A CIM is often called “the book” and can also be called the “Offering Memorandum” (OM) or “Information Memorandum” (IM). In other contexts, it might be called a “Prospectus.” This document provides narrative information about the company’s history, operations, customer and supplier bases, and prospects, as well as some additional detailed financial information that a potential buyer may not be able to see on the income statement or the balance sheet. Use of a CIM also guarantees that Seller information is presented to prospective Buyers in an organized, comprehensive way that can’t be forgotten or “mis-remembered” by either party in the way face-to-face conversations can be. The CIM also helps Sellers prepare for a sale, because the process of preparing the document leads Sellers to better understand their company, its vulnerabilities, and its value proposition. A CIM document is not essential for a sale—in fact, many businesses under $1 million in EBITDA sell without a CIM having been prepared. However, a CIM makes the deal process much more straightforward to all involved, and the existence of a CIM can give Buyers a good hint about how organized and methodical the Sellers have been with the company during their ownership. Generally, business owners do not write their own CIMs. The M&A advisory firm the business owner has chosen to work with would prepare the CIM. CIMs are a lot of work, so business owners who do not have their business on the market will generally not have a CIM just lying around. Sellers or, more commonly, their advisor, will send a teaser to prospective buyers to generate interest. Once a buyer has contacted the advisor they will sign an Non-Disclosure Agreement (NDA) to receive the CIM. CIMs are never shared without an NDA. The “NDA” is a Non-Disclosure Agreement—also sometimes referred to as a “Confi” or Confidentiality Agreement. At the most basic level, the NDA prohibits potential buyers from using any of Seller’s business information for any purpose other than for evaluating the transaction. Some NDAs are very simple letter agreements; others run to six or seven pages and include very specific prohibitions on soliciting the Seller’s employees or contacting its customers or suppliers. The NDA serves both a moral and legal purpose. First, the formal act of signing an NDA reminds honest people of their responsibilities and keeps them honest. Secondly, it gives the Seller a means for legal recourse against bad actors posing as Buyers. In particularly competitive situations, in addition to an NDA, the Seller may want to postpone the provision of highly sensitive information until later in the sale process or provide it on a redacted or “masked” basis. In any case, the balance between the Buyer’s need for useful information and the Seller’s legitimate concern about maintaining control of its proprietary information must be struck carefully based on the facts and circumstances. Unlike a CIM, which is not essential, an NDA is critical for protecting the Seller’s interest. It’s also important for protecting the eventual Buyer, who can be sure that every other prospective Buyer who saw “under the hood” of the business is legally obligated to preserve confidentiality, and that there is some recourse to the final Buyer if that confidentiality is breached. The “LOI” is a Letter of Intent, or a Letter of Interest. Sometimes the parties use a “Term Sheet” which, if signed by the parties, is the same in substance—just a different format. The LOI is a non-binding statement of the basic terms of the transaction that the parties have agreed on, plus a few binding provisions for continued confidentiality, exclusivity of dealing, and the like. Desired structure of the deal. 2. Seller agrees not to engage with any other party for the purpose of entering into a sale agreement until 60 days after the signing of the term sheet or until Buyer has withdrawn this active offer. Transaction is subject to the following: finalization of an asset purchase agreement which will contain representations and warranties customary to transactions of this type and size and other documents necessary to complete the transaction; financing to be obtained to Buyer’s satisfaction; and Buyer’s completion of legal, financial and operational due diligence to Buyer’s satisfaction. Dated signature from both parties. Although the terms are generally not legally enforceable, the LOI is valuable because it fixes basic business terms before the parties get into the expensive and time-consuming process of due diligence, detailed negotiations and documentation of a deal. Smart Buyers and Sellers will include their accountants and lawyers in a review of the LOI before signing it, because they can often spot issues that the parties themselves may not have considered. It is rare that a business owner accepts an LOI without some amount of negotiation. Although business terms can change after an LOI is signed, it’s much less time consuming, and less costly, to get the basic terms and structure right at the LOI stage. Once the LOI is done, due diligence ramps up (if it hasn’t already), and so does the negotiation of the PSA, or the definitive Purchase and Sale Agreement. Definitive Purchase Agreements can also be called: Purchase Agreements, Stock Purchase Agreements, Asset Purchase Agreements, Stock Sale Agreements, or Asset Sale Agreements. The buyer’s attorney generally drafts the Definitive Purchase Agreement. Then the buyer, seller, and their advisors negotiate the document. If the LOI is clear and detailed, the attorneys are experienced in business transactions, and the Buyer and Seller are reasonable, then the process of negotiating the PSA is less likely to be protracted. For the PSA, the finer details of the transaction must be worked out. Key among those details are the disclosures and the “Representations and Warranties” made by the parties—primarily the Seller. The importance of these Reps and Warranties isn’t obvious at first, but they are critical to making sure the Buyer gets what it bargained for, and the Seller hasn’t promised something it can’t deliver. Conditions and covenants that give the Buyer an escape hatch if the business’s condition changes between signing and closing. Although, the PSA is often signed at the closing table and thus, these conditions and covenants would be excluded. Transaction professionals tend to use a lot of jargon, and CIM, NDA, LOI and PSA are probably the first of many acronyms you’ll hear. If we jump ahead of our clients with our jargon, the clients shouldn’t hesitate to ask for clarification. It’s important for Buyers and Sellers to understand the process clearly, and if in our hurry to get a deal done we accidentally get ahead of them, then they can back us up and demand clarity.